Here's how Tylerites can make the switch to renewable energy, whether through the power they draw from the electrical grid, or by generating their own power and becoming more self-sufficient in the process. Tyler residents Scott and Elicia Eckert installed solar panels on the roof of their home in Hollytree. Photography by Jamie Maldonado. We recently explained how Texas—a state long associated with oil and gas booms—became an unexpected national leader in renewable energy production, drawing on its incredible wind and solar resources. Of course, those resources aren’t evenly distributed: the piney woods of East Texas are far less hospitable to wind turbines and solar farms than the plains of West Texas. The good news is Tylerites can still make the switch to renewable energy, whether through the power they draw from the electrical grid, or by generating their own power and becoming more self-sufficient in the process. How much does it all cost, and can you really save—or even earn—money by switching to renewable energy? I talked to a wide array of folks, from a Lindale-based solar installer who’s installed panels on hundreds of East Texas homes, to big retail electricity providers, to a pair of Hollytree homeowners who took control of their energy usage and reduced their carbon footprint. The takeaway: there are far more options available to Tylerites than I realized, and one of the most significant changes you can make takes just a few minutes. Let’s dig in. I’m a Tyler resident or business owner. What’s one thing I can do today to start using renewable energy? Switch your monthly electrical plan to one that purchases energy from renewable sources like wind and solar. There are a number of websites that help you compare plans, like Choose Texas Power, where you punch in your zip code and filter the results to show only renewable energy plans (they might call them “green energy,” “clean energy,” or something similar). At Choose Texas Power, I found eight fixed-rate renewable energy plans serving the 75701 zip code. The costs of these plans ranged from just under 10 cents per kilowatt hour to about 15 cents, with an average cost of about 12 cents. So how did that compare with non-renewable plans? There were 38 plans to choose from, ranging from 7 cents to about 15 cents, with an average cost of about 11 cents. The average Texas home uses about 1,100 kilowatt hours per month. So you can expect to pay about $11 dollars more per month if you choose one of the renewable energy plans offered through Choose Texas Power—more or less depending on which plan you chose. If I choose a renewable energy plan, will all of my power come from wind, solar, and other sustainable sources? It’s important to understand that power doesn’t flow directly into your home from, say, a wind turbine spinning over a cattle ranch in Comanche County, or from a coal plant in Bexar County. Both types of power stations pump electrons into the same electrical grid, and that grid delivers energy to your home or business. Think of the grid as a big pot of soup: once electrons are dumped in, it’s impossible to tell where they came from. If it’s impossible to know who generated the electrons heating up your microwave burrito, how do electricity providers offer “100 percent renewable energy plans”? Each time a wind turbine, solar farm, or other renewable power station pumps one thousand kilowatt hours of energy into Texas’s electrical grid, a “renewable energy credit” is logged by the nonprofit organization that oversees the grid. Retail electricity providers like Green Mountain Energy and Reliant buy those credits, and the amount they buy matches the amount of energy their customers are using. That’s how everyone keeps track of how much renewable energy is flowing through the system, and who’s paying for it. Tyler’s not as sunny as other parts of the state. Is it worth trying to generate my own rooftop power here? Our region may not be a sun-drenched solar hotspot, but that doesn’t mean you shouldn’t consider installing a rooftop solar array on your Tyler home or business. 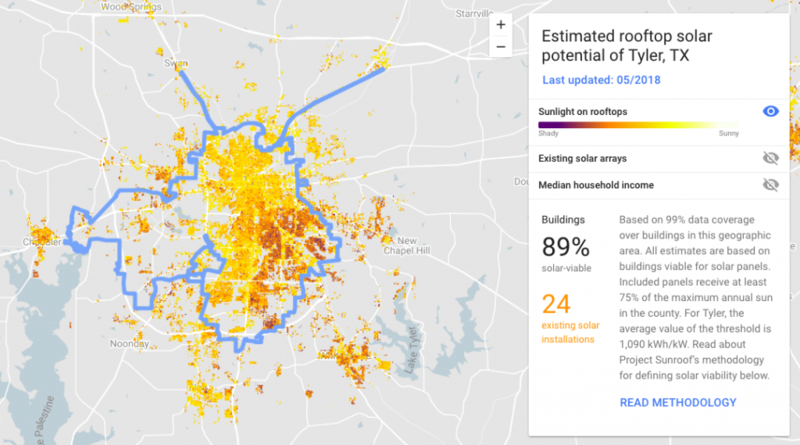 To see exactly how well solar might work on your home, check out Google’s Project Sunroof. You can plug in your home or business address and get all sorts of useful stats about how much money you could save by installing solar, and the potential environmental impact, based on 3D models of your home and nearby trees provided by Google Earth. I tried out my home address and learned that my family stands to save $3,000 over 20 years by installing our own solar panels. The environmental impact would be equivalent to taking 1.3 cars off the road each year, or growing over 150 trees over 10 years. You can also see data for your whole city. In Tyler, 89 percent of buildings are “solar viable” according to Project Sunroof, about 32,000 roofs total. If all of those buildings were to switch to solar energy, the potential impact would be equal to taking nearly 120,000 cars off the road for one year, or planting over 14 million trees over 10 years. Data for Tyler, Texas from Google’s Project Sunroof. How does rooftop solar work in Tyler, and how much does it cost? Dale Beggs runs a solar installation company in Lindale called GreenLife Technologies. He became interested in renewable energy as a local high school student in the ’80s, spent most of his career in the construction industry, and took advantage of the Great Recession downturn in the building business to travel to California and get certified as a solar installer. Here in East Texas, his customers say saving money over the longterm is their number one motivation for installing their own solar panels. Like a lot of Beggs’s clients, Elicia and Scott Eckert had a mix of reasons for installing solar panels on their home in the Hollytree subdivision. Elicia grew up in a Plano home that was always interested in recycling and conservation. She says her parents “approached it from the Christian perspective of wanting to be good stewards of the gift of creation.” Scott liked the longterm cost savings and the “nerdy” factor of maximizing their energy efficiency. When looking for their home, the Eckerts told their realtor that they wanted a south-facing roof, because they knew they wanted to cover it in solar panels. 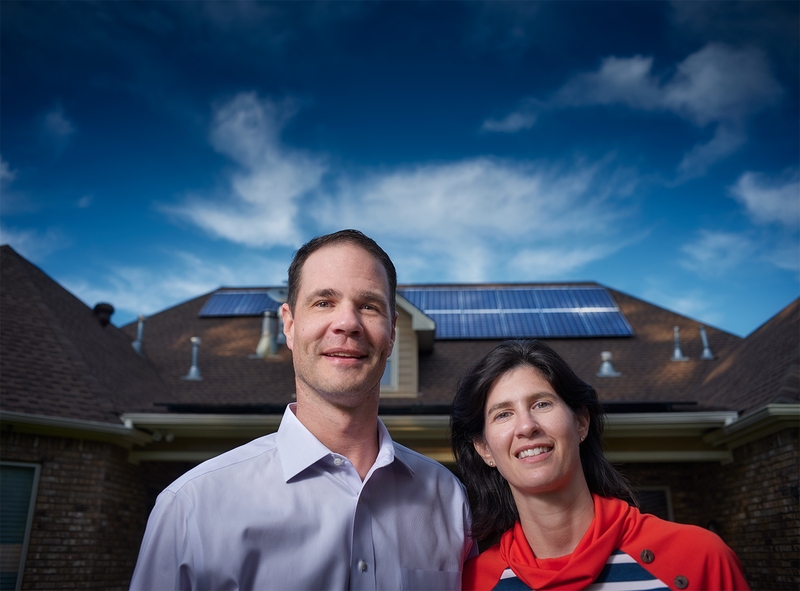 The Eckerts first installed solar on their home in 2013, and expanded their array this year. Overall, they’ve spent just over $20,000. It would have been at least $20,000 more, but tax credits from the federal government and an incentive program from ONCOR brought the costs down by half. In terms of longterm savings, the Eckerts don’t have an electric bill at all nine months of the year, and their summer bills have been cut in half. Scott expects the project to pay for itself in 12 years, and after that, he says, “every kwh produced is all profit.” He expects to save up to $12,000 over 25 years, and more if energy prices continue to rise. “Assuming one stays in their home, that is a pretty decent investment,” he says. It’s important to understand that installing a solar array in a city like Tyler is unlikely to mean that you’re totally energy independent. You’ll probably still be connected to the grid through your retail electricity provider, and you’ll still draw power from the grid on cloudy days, especially if you don’t have a way to store your own solar power. The Eckerts use Green Mountain Energy, one of a small handful of companies operating in East Texas that offers “net metering,” a program in which electricity providers actually pay customers with solar arrays for any extra power that they produce but don’t end up using in their own homes. GreenLife Technologies owner Dale Beggs says he works with new customers to analyze their energy needs over the past year, along with their roof’s sun exposure and other factors, to help determine how much energy they’re likely to need and how large their array should be. In more remote and rural parts of East Texas, Beggs has worked with customers who are indeed completely cut off from the rest of the electrical grid, and chose solar energy because it dramatically reduced the costs of powering their homes (or may even have been their only option). This all sounds super cool, and I’m thinking about switching to a renewable energy plan, or even investing in solar energy. If my reporting has helped you understand this issue, or even motivated you to change your current spending habits or invest in something new, I’d really like to know about it.